There’s a proverbial saying that goes “different strokes for different folks“. The same goes for travelling. There are travellers who wants to pamper themselves in luxury, and there are those who do backpacking and prefers the off-the-beaten path. In booking hotels, there are travellers who look for luxurious staycations complete with amenities, swimming pool, spa services, and more. And there are those who prefer it simple without the fancy stuff. 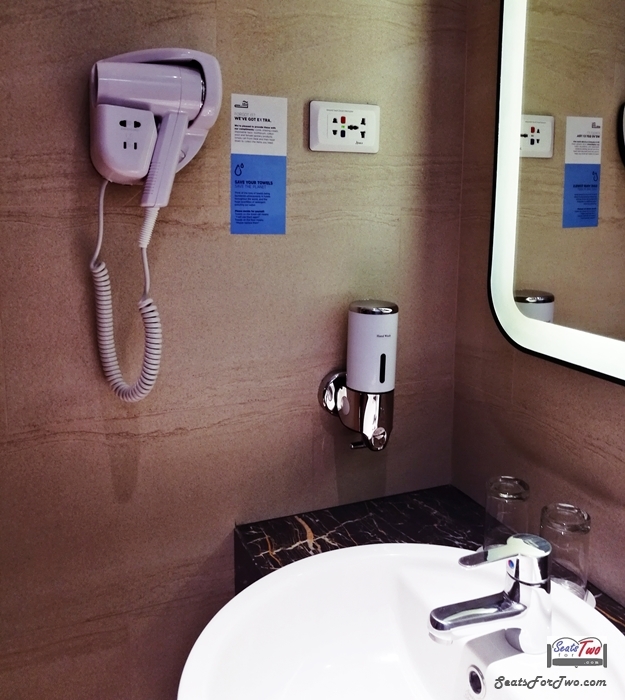 Others may refer to this as “transient travellers,” but the new Holiday Inn Express Manila (HIEx) in the Resorts World Manila complex calls them “smart travellers“. Holiday Inn Express Manila Launch led by Mr. Stephen Reilly, Chief Operating Officer, Resorts World Manila with HT Chea, Holiday Inn Express Manila’s General Manager. 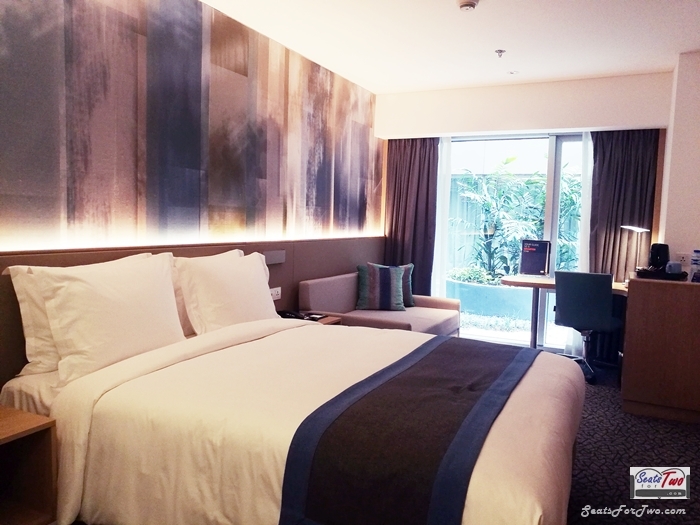 Right across the Terminal 3 of Ninoy Aquino International Airport / Manila International Airport, this is exactly the clientelle HIEx had in mind as they opened their first Holiday Inn Express in the Philippines a few weeks ago. 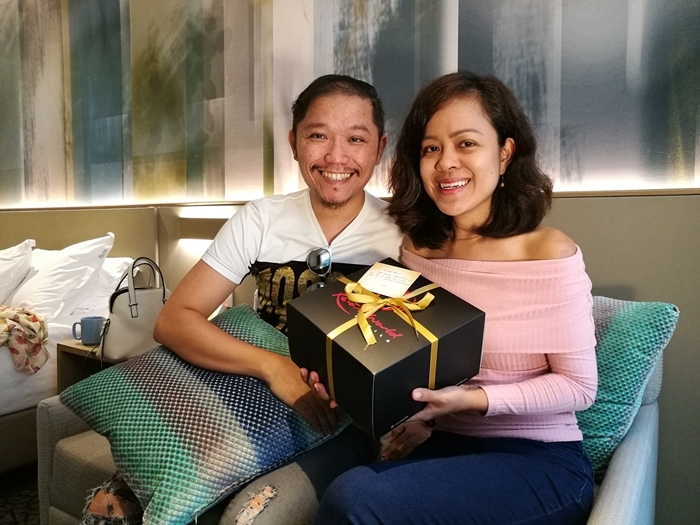 Surrounded by several luxurious hotels such as Maxims Hotel, Marriott Manila, and more upcoming international hotel brands, this is actually what sets Holiday Inn Express Manila apart. 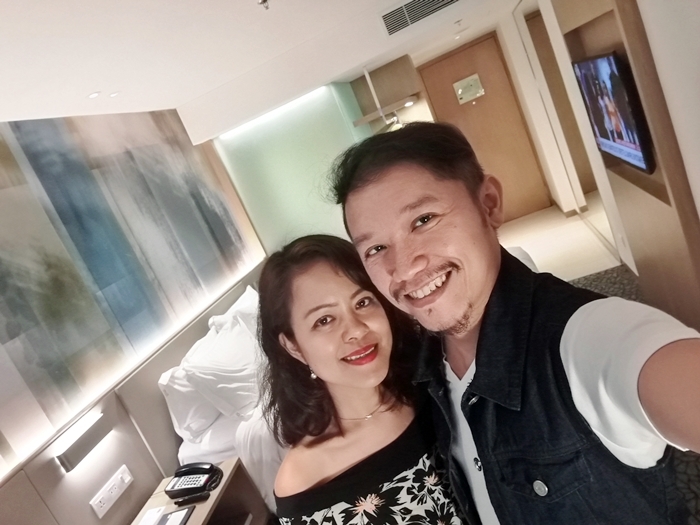 Having a right-sized accommodation for a queen-sized bed or an option for two single beds, the hotel rooms are pleasantly simple and direct tot he point with supporting amenities that addresses a traveller’s basic needs. The above-mentioned launch led by Mr. Stephen Reilly, Chief Operating Officer of Resorts World Manila and HT Chea, General Manager of Holiday Inn Express Manila. It was then followed by a media tour around the property showcasing the different hotel room types and hotel amenities. Today’s Holiday Inn Express Newport City used to be the old Remington Hotel. 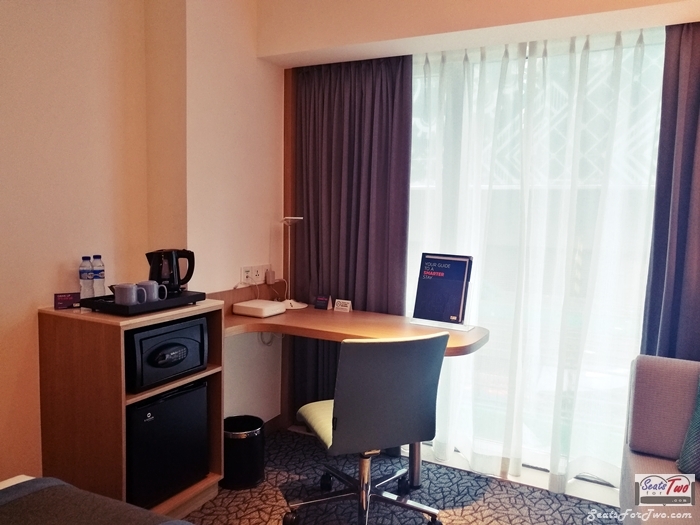 Now, we are glad to see a fresh, modern, and chic accommodation in contrast to the previous Remington. However, full operation and complete transformation is expected by the end of this year or early 2019. Currently, the 1st and 2nd floors are already converted complying with Holiday Inn Express standards. 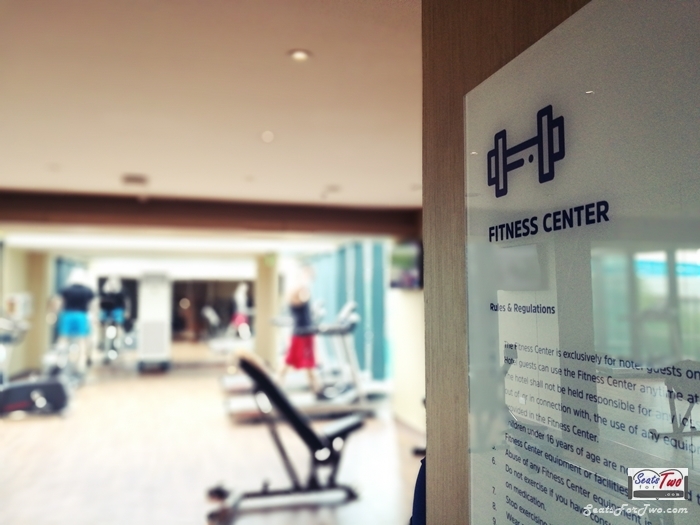 While the hotel lobby has yet to be converted with their planned – the Great Room, outstanding hotel amenities already include WiFi access at the lobby and in the rooms, luggage storage, basement parking, meeting room, and 24/7 free airport shuttle service. 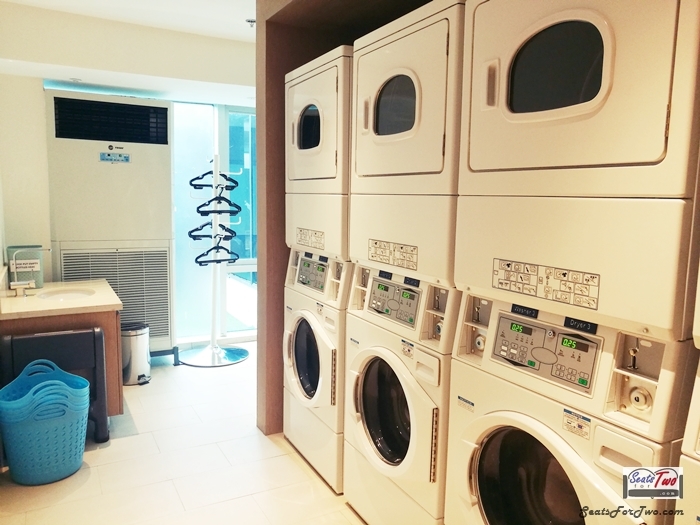 Interestingly, they also have a 24-hour coin laundry with ironing facility and 24-hour access Fitness Center. For the rooms, as mentioned above, guests can book a bedroom with a queen-sized bed or two single beds. 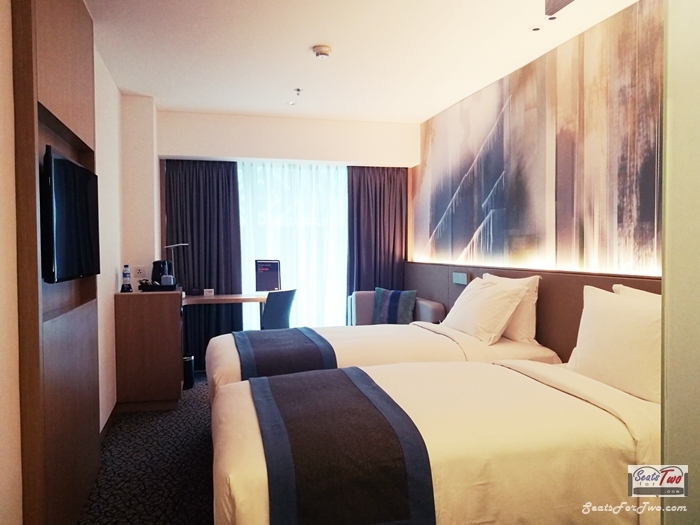 The hotel rooms feature HIEx‘s signature sleep solutions with its blackout curtains, comfortable beddings, with a choice of firm or soft pillows. Moreover, the en-suite bathroom comes with a hot & cold power shower. 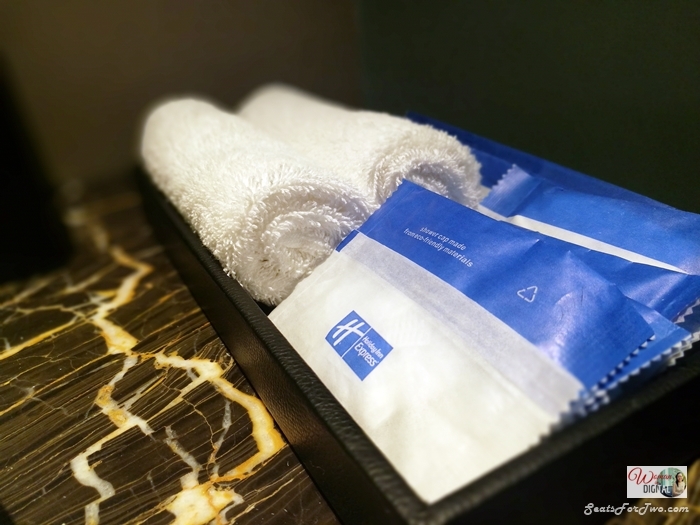 Basic toiletries are provided but you will not find the usual small shower gel and shampoo bottles as the hotel utilizes a dispenser for the shower gel & shampoo in one. For ladies who prefer a separate shampoo and conditioner, we suggest bringing your own; otherwise there’s a nearby 7-Eleven convenience store. Each room has international power plugs with USB sockets. These are located at the bedside and the working station. We enjoyed watching movies in the 42″ flat screen television, noticeably much bigger compared to the old Remington Hotel TV. On one side is a lounge sofa convertible to sofabed. Other facilities include the coffee and tea facility, refrigerator, and hairdryer. 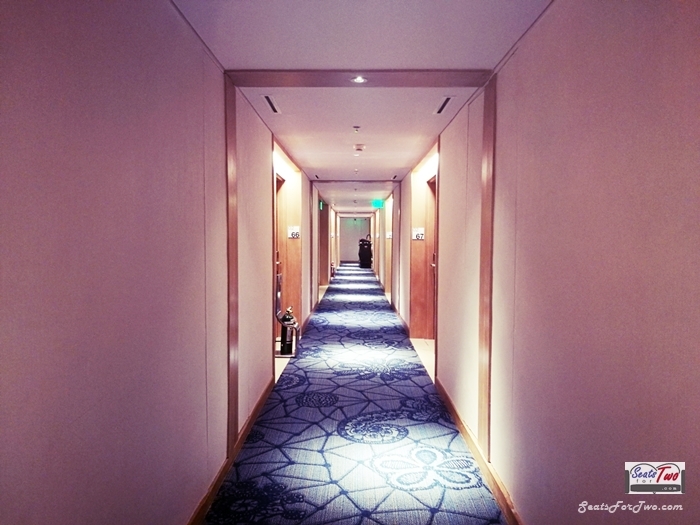 Guests who travel lite need not worry as almost everything you need is right inside the hotel. As mentioned above, located at the 2nd floor are the gym and coin-operated laundry machine room. You can also do your shopping at several shops inside the Newport City Mall nearby. Furthermore, there are a variety of restaurants to chow-on, from fine-dining hotel restaurants, to fast foods and coffee shops. 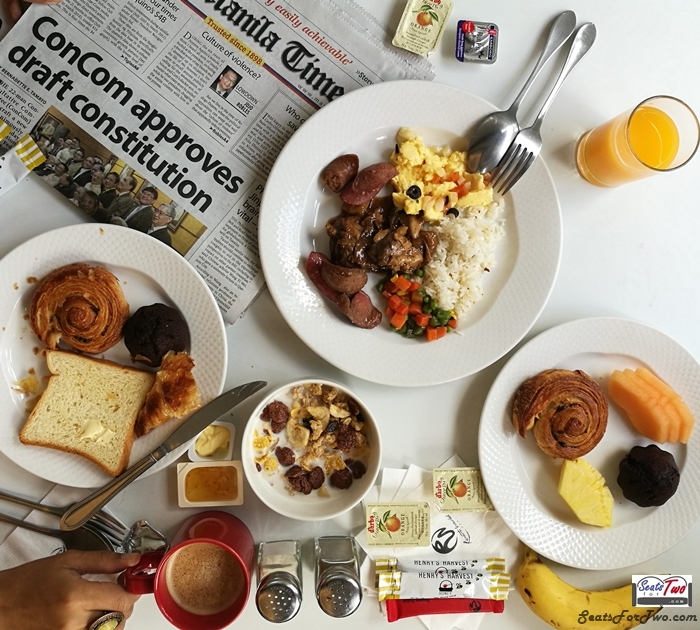 Breakfast On-The-Go or Breakfast Buffet? Travellers on-the-go will find the Grab & Go packed breakfast feature convenient. It’s an alternative you may choose in exchange for the breakfast buffet if you have a really early morning flight. 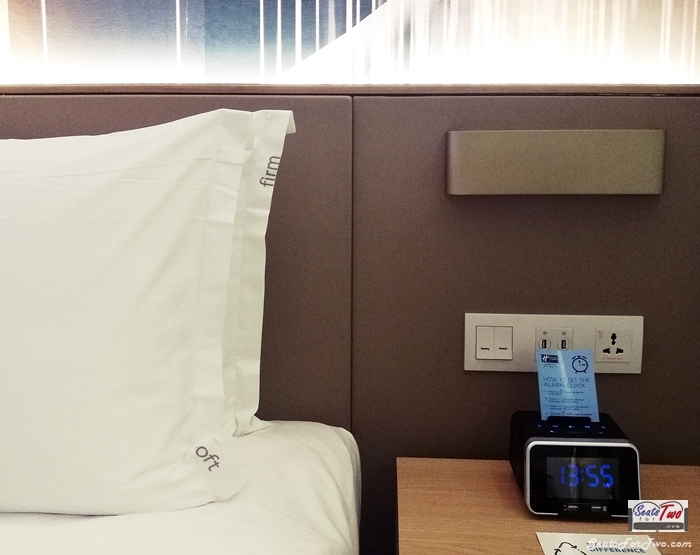 Inform the hotel in advance that you’re leaving early the next day so you can simply grab a breakfast and go straight to the airport. 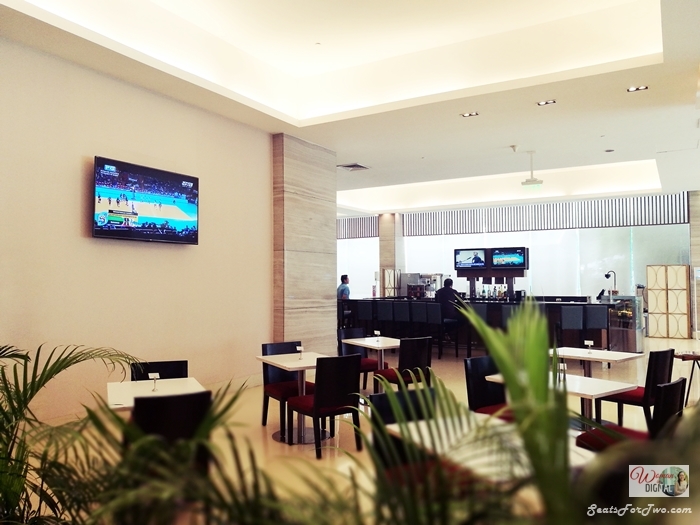 Holiday Inn Express Manila has a 24-hour dining available through the lobby cafe. As for Seats For Two, we’re not necessarily in a hurry so we had a breakfast buffet the next morning. 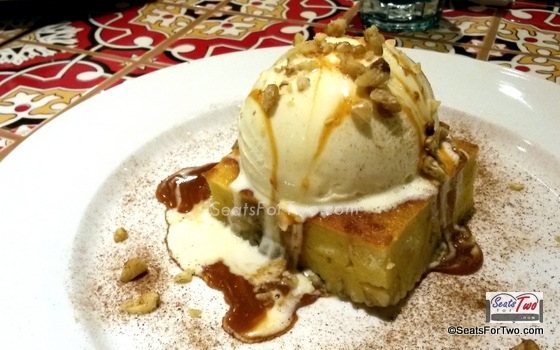 The spread was basic and satisfactory enough with breads, oatmeals, fruits, rice, viands, and juices. Holiday Inn Express Manila is just a 10-minute walk from the Ninoy Aquino International Airport Termnial 3 via the Runway Manila bridge. It’s also just a short ride to and from Terminals 1 and 2 , sans Manila traffic, via the free Resorts World Manila airport shuttle. HIEx Manila is also accessible to the central business districts of Makati and Bonifacio Global City / BGC. Thank you to HIEx Manila and Cafe Maxims of Resorts World Manila for these yummy pastries. 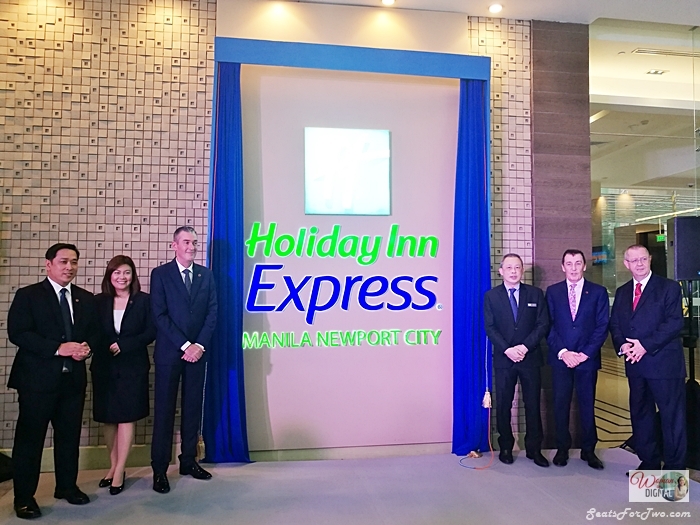 A part of the InterContinental Hotel Group (IHG), Holiday Inn Express Manila Newport City, joins Resorts World Manila‘s (RWM) growing portfolio of international hotel brands including Marriott Manila Hotel, and the soon-to-open Hilton Manila, Sheraton Manila Hotel, and Hotel Okura Manila. 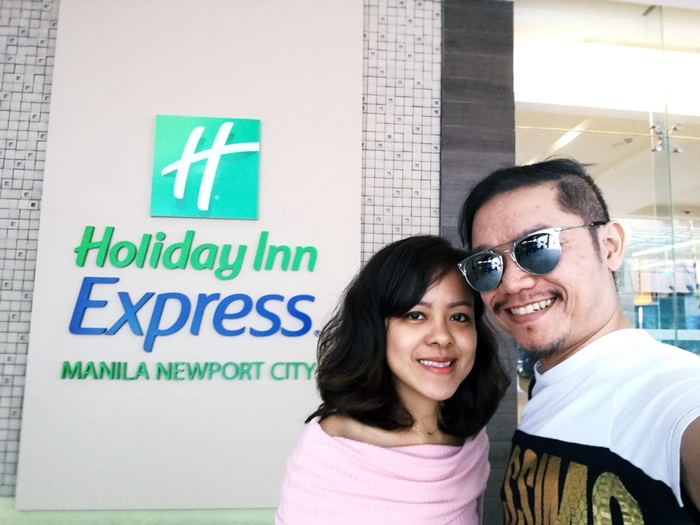 As fellow smart travellers, our work-cation experience at the newly opened 700+ room Holiday Inn Express Manila in Newport City was both practical and convenient.